Nestle Australia will be selling a range of special edition KITKATs to help celebrate the Lunar New Year. 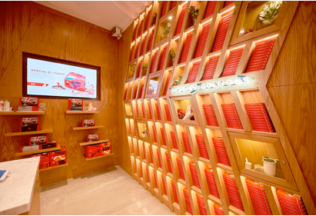 Only 500 of the KITKATs will be sold through the KITKAT Chocolatory store located in Melbourne city. The KITKATS come as gift boxes, with eight individually wrapped single pieces inside a bamboo box for AUD $68. The boxes are available now until 4 February 2017. The Lunar New Year commences 28 January 2017. Those who follow Lunar New Year celebrations traditionally exchange gifts to wish others food fortune, prosperity, wealth and success for the year ahead, with the number eight carrying great significance in Chinese culture, symbolising luck.